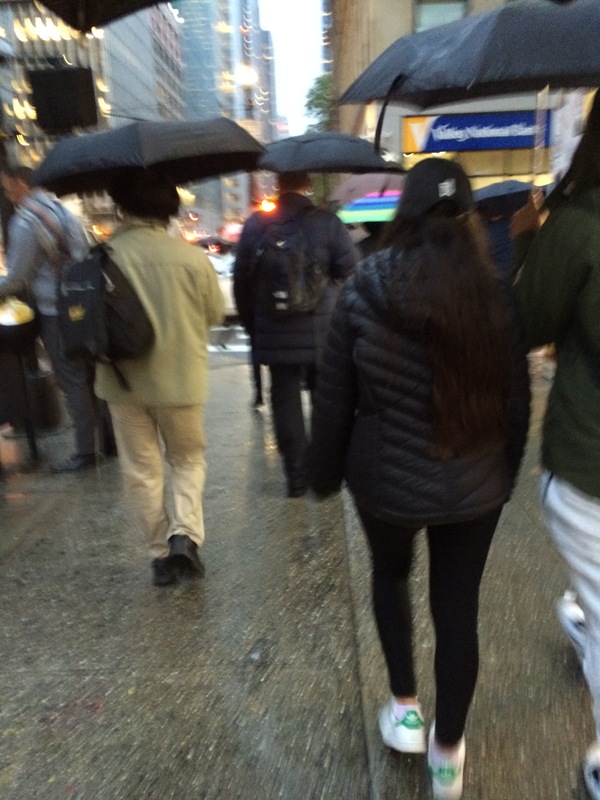 A month or so ago, I was in New York attending a workshop for artists on one of those pouring rainy days where an umbrella doesn’t even help much. As I was walking the 10 or 15 blocks north of Penn station, I thought of a kind East Asian man that I met about 17 years ago on the streets of New York City. I don’t know his name or anything about him, and I don’t really remember at all what he looked like. I was commuting back and forth between my parents’ home in NJ and Times Square every day working at Random House at that time. It was at that job that I would realize I’m not really cut out for the more corporate world- even book publishing. I was the assistant to a woman who had quite a reputation in our department for being difficult. Her presence back and forth from the file cabinet near my cubicle made it hard for me to breathe. She yelled at me numerous times as I tried to navigate the world of book production: purchase orders to printers, creating bar codes, checking book covers for color. Every morning as my bus went through the Lincoln Tunnel and I drifted in and out of sleep, I would in my mind cry out desperate prayers, mostly just “help me God!” because I was so afraid of this woman. Now, I don’t know if the same thing had happened to him, or if he was just trying to ease my embarrassment, but 17 years later, I think of him every time I’m in the city and it’s raining, and I’m stepping around those metal grates. I’m thankful for the gentle way in which he stopped amidst the huge moving crowd, none of whom even seemed to notice my fall, and helped me though he must have no recollection of this day. As January nears its close, I’m thinking not about the grand resolutions and goals we set for ourselves, but about the small ways that we can effect change, in ourselves and in others. Since Christmas, my daughter’s been leaving me tiny little notes hidden around the house. They are small, but they bring me so much joy. I think it’s hard as a child to always be on the receiving end of things, and she longs to give in our relationship. This is one way she’s discovered to do it. In the realm of tiny, I also want to mention a free one week course I took online two weeks ago based on the research of a Stanford psychologist. It’s called “Tiny Habits.” The idea behind the course is to attach tiny habits to anchors, or established habits you already have. The key is to keep them very small at first, less than 30 seconds in fact. So, for example, I added 1 push-up after brushing my teeth at night. Two weeks later, I’m up to five and haven’t missed a night. In the morning, when my feet hit the floor, I added a sun salutation to the “Our Father” prayer. What surprised me most about these “tiny habits” is that you don’t have to have everything else together to start them. As you start, they begin to carry over into other areas of your life and the tiny really builds into something substantial and long-lasting, and it doesn’t even feel like work! If you’re running out of steam for your new years’ goals and sweeping declarations, maybe you were thinking too big. Small and simple acts are powerful, and sometimes remembered long afterwards: just one push-up, tiny little notes reminding me to be joyful, and on rainy city days, I will always step around the metal grates thanks to the kindness of a stranger in a difficult period of my life. How sweet of her! Yes, I couldn’t agree more with your sharing…it’s the simple acts of kindness and love that gives us hope and keeps us warm! Oh yes, small acts, they do add up, and leave an impresssion. 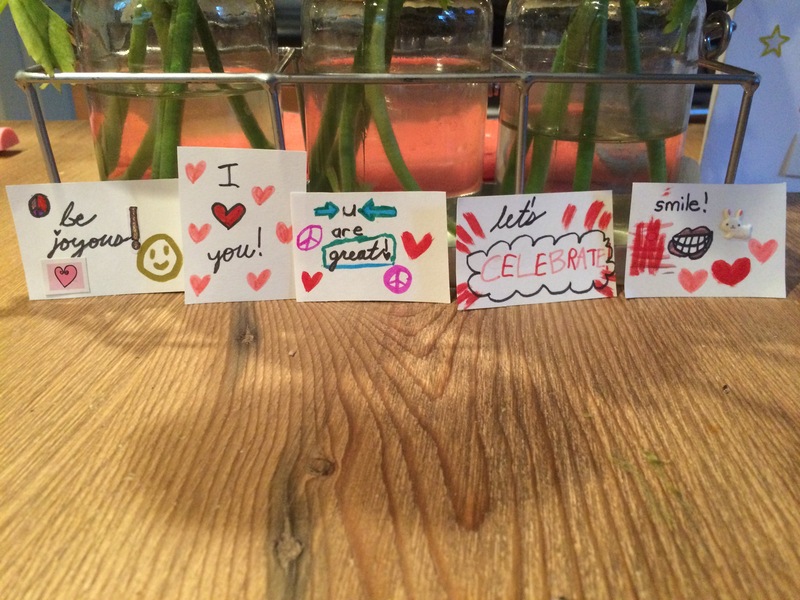 I love your daughter’s sweet and creative notes! I am always so excited to see that you have posted on your blog. Your entry today was just what I needed and I am going to share it with my 16 year old daughter. Thank you for writing. Thanks for sharing that with me Beth! I’m working on a long-term writing project so my posts here are going to be briefer like this one, but I hope still somewhat thought-provoking or useful! Thank you for reading.